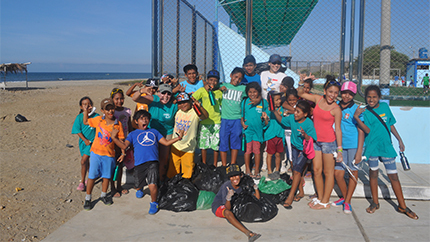 In recent years, deforestation, trash build-up, and contamination of beaches has risen in the Tumbes region of Peru, negatively impacting both marine life and the tourism industry. A team of Peruvian alumni became concerned and decided they wanted to reverse this trend. As part of their "Sowing Awareness" project, a winner in the 2014 AEIF competition, the 11-member alumni team facilitated a series of workshops for a group of 30 students, ages 9 to 16, on the importance of ecological diversity. The experience-based workshops allowed the youth participants to explore various environmental protection activities in their local community through photography of nature, city landscape management, a beach clean-up campaign, and identification of local flora and fauna. The alumni team partnered with the local National University of Tumbes, local government, and NGO Eco-Fundo La Caprichosa in Piura to plan ongoing reforestation efforts in the region past the completion of the AEIF project. The “Sowing Awareness” project provides an answer to reversing the tide of environmental degradation by promoting public awareness and empowering youth as environmental activists.